Easy to use, refillable and rechargeable ... you'll be SURE to love it! Excellent for use with most light liquids. Sprays liquids without CFC's, Freon, or other dangerous propellants - instead, uses compressed air as the propellant. As easy to use as an aerosol; just point and spray! And it's refillable and rechargeable - you'll never run out of air! 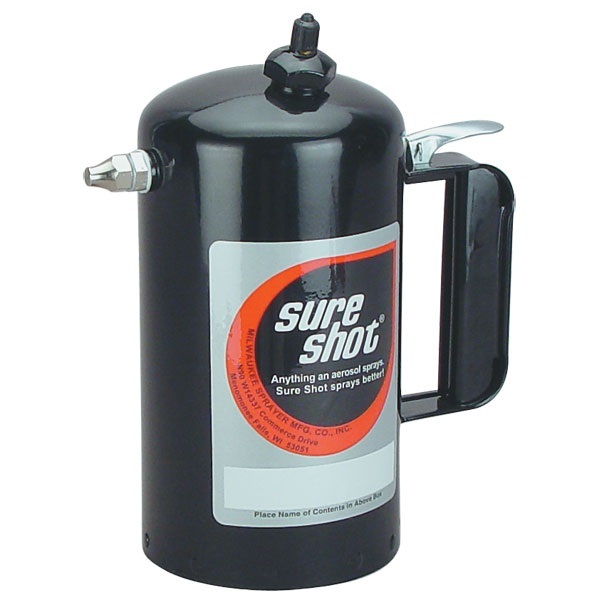 To change liquids, simply depressurize, refill, close, and recharge with your compressed shop air. Max capacity is 32 oz. Max pressure 200 psi. Made in USA with high-grade steel. Includes Standard Solid Cone Pattern Spray Nozzle for medium density materials. 4" wide, 8-3/4" high, 6" long.